Dry Bulb (DB) temperature is the temperature of air as registered by an ordinary (mercury) thermometer. DB temp is indicative of the sensible heat content of the air. Wet Bulb (WB) temperature is the temperature of air as registered by a thermometer whose temperature sensing bulb is covered by a material (cloth) soaked in water and exposed to a rapidly moving current of air. The evaporation of the moisture surrounding the bulb cools the air. WB temp is indicative of the total heat (sum of both sensible heat and latent heat) content of the air. Dew Point (DP) temperature is the temperature at which condensation of moisture begins when the air is cooled by removing sensible heat only. DP temp is indicative of the moisture content and latent heat in the air. It is the best indicator of comfort conditions. Humidity Ratio (W) is the weight (lbs) of water vapor per unit weight (1 lb) of dry air. It is the moisture content of the air and it is indicative of the latent heat content of the air. Saturated Air contains the maximum possible moisture (water vapor or steam) that the air can hold at a given DB temp. This maximum moisture content increases with increasing temperature. Relative Humidity (RH) is the ratio of the actual water vapor pressure at a given DB temp to the water vapor pressure of the air if the air was saturated at the same DB temp. RH is a ratio of water vapor pressures and not a ratio of moisture contents. However, it is very close to the ratio of moisture contents and the difference is about 2%. Degree of Saturation (DS) is the ratio of moisture content (or humidity ratio) of the air at a given DB temp to the moisture content (humidity ratio) of the saturated air at the same DB temp. For HVAC design and for all everyday practical purposes, Relative Humidity (RH) and Degree of Saturation (DS) can be considered to be almost the same. Figure ? shows typical summer outdoor air conditions for a location such as Chicago and the desirable indoor air design conditions in summer. Note that the outdoor RH is 40% but the indoor RH is higher at 50%. All other psychrometric parameters (DB, WB, DP, W and H) of the indoor air is less than that of the outdoor air. Both the heat content (H) and moisture content (W) were removed by cooling the outdoor air. Sensible Heat Gain (SHG) or Loss (SHL) is the heat gained or lost by a substance (solid, liquid or gas, in this case air and water vapor mixture) without a change in state from solid to liquid or liquid to gas. There is a change in DB temp only. Latent Heat Gain (LHG) or Loss (LHL) is the heat gained or lost that changes the state of a substance (in this case the water vapor part only of the air and water vapor mixture) from solid to liquid or liquid to gas (in this case the water vapor part of the air and water vapor mixture). Total Heat Gain (THG) or Loss (THL) is the sum of the sensible and latent heat gained or lost. Enthalpy (H) or heat content is the total heat contained in the air and water vapor mixture. In English (IP) units the heat content of the air is measured from 0oF and the heat content of the water vapor is measured from 32oF which is the freezing point of water at standard pressure. So the enthalpy of dry air below 0oF is a negative value. The enthalpy of moisture below 32oF is not a factor since most of it will have condensed and then frozen out as ice from the air. In metric (SI) units the enthalpy of both the dry air and water vapor is measured from 0 oC. Sensible Heat Factor (SHF) is the ratio of Sensible Heat removed (applies mainly to cooling processes) to the Total Heat removed. SHF = SH/TH. Enthalpy Deviation. The enthalpy values shown on the psychrometric chart are at saturation (100% RH and DB = WB = DP). The constant enthalpy value lines are assumed to be along the constant WB temp lines. Theoretically there is a very slight deviation between the constant enthalpy and WB lines that can be ignored in HVAC process calculations. Figure ? shows a heating and humidification process. The heating is by a heating coil which could be electric resistance or a coil of tubes with hot water or steam passing through it. In practice the humidification process includes some sensible heat gain of the dry air by the steam also. De-humidification is usually done by a cooling coil with chilled water passing through it’s tubes. The sensible heat and latent heat removal occurs simultaneous as the air temperature approaches the saturation temperature of the. It does not occur separately as shown in the figure. Latent heat removal can also be done by passing the moist air through desiccant material substances that will absorb the moisture from the air. The desiccant material has to be replaced routinely after it has absorbed all it can and is completely soaked with water. The air passing through such a dehumidifier can pick up some of the desiccant material contaminating the supply air to the space. So for this reason desiccant dehumidification is used mainly in industrial air conditioning. Given any two psychrometric conditions, all the other psychrometric conditions can be read off the chart or calculated with equations that relate them to each other. In practice outdoor air conditions are given as Dry Bulb (DB) and Wet Bulb (WB) temperatures and the desired indoor air design conditions are given as Dry Bulb (DB) temperature and Relative Humidity (RH). If the WB is known then the Enthalpy (H) is known (and vice versa) and a second condition is not required. The constant value WB and H lines on the psychrometric chart are the same. If the Dew Point (DP) is known then the Humidity Ratio (W) is known (and vice versa) and a second condition is not required. The constant value DP and W lines on the psychrometric chart are the same. At 100% RH, DB = WB = DP. DP is calculated from DB and WB. Weather data from the National Climatic Data Center show DB (measured with a normal mercury thermometer) and WB (measured with a sling thermometer) temperatures. RH measurement methods (using a hygrometer) are approximate. Barometric Pressure (BP or P) of the atmosphere is measured with a barometer. Evaporative cooling towers are selection is based on WB. DP together with DB is the best indication of weather and comfort air conditions. The terms DB and WB are used in HVAC applications. When the temperature is given without any qualifying indication such as DB, WB or DB, it is assumed to be DB. 1. A given mass of dry air occupies 2100 ft3 and it's temp is 45 F. What is the volume of the air after it is heated to 125 F.
2. What is the volume of 100 lbs of dry air at 120 F and 5.3 pounds per square inch gauge (psig). Only one set of conditions is given. However the properties of standard air are known and this can always be used as the second set of conditions. They are 70 F temperature, atmospheric pressure of 14.7 pounds per square inch absolute (psia) and volume of 13.34 ft3/lb. T1 = 460 + 70 = 530 K , P1 = 14.7 , V1 = 13.34. P1V1/T1 = 0.37. T2 = 460 + 120 = 580 K , P2 = 5.3 psig + 14.7 = 20 psia. Volume of 100 lbs of air at 120 F and 5.3 psig = 1073 ft3. 1.Room-1 is at 80 DB and 50 RH. Room-2 is at 70 DB and 90 RH. Which room has the higher heat content? 3. A room is at 80 DB and 50 RH. An air-conditioning unit starts to cool the air. At what temp will the moisture in the air start to condense? What is the initial and final enthalpies and humidity ratios? 4. 100 lbs of air at 80 DB and 50 RH is cooled to 50 DB. How much (1) heat was removed, and (2) moisture was removed? 5. 1000 ft3 of air (density 0.075 lbs/ft3) at 80 DB and 50 RH was cooled to 50 WB. How much (1) sensible heat (2) latent heat (3) total heat, and (4) moisture was removed? 6. 2000 cfm of outside air (OA) at 100 DB and 85 WB is mixed with 8000 cfm of return air (RA) at 75 DB and 40 RH. Calculate mixed air (MA) weight, DB, WB, DP, RH, W, H? Air density = 0.075 lbs/ft3. When different quantities of two identical fluids (liquids or gases) but at different conditions are mixed (added together) then the new quantity is the sum of the two quantities. Example, 10 lbs of water added to 5 lbs of water is 15 lbs of water. 2000 cfm (cubic feet per minute or ft3/min) of OA when mixed with 8000 cfm of RA adds up to 10,000 cfm of MA. The mass of these volumes of air is volume x density. OA = 2000 * 0.075 = 150 lbs, RA = 8000 * 0.075 = 600 lbs, MA = 10000 * 0.075 = 750 lbs = OA + RA. The mixed air condition is the weighted average of the conditions of the two fluids that were mixed. You can find the weighted average by using the weights or volumes of OA and RA since they are in the same proportion. Example, 2000 cfm of OA at 95 DB when mixed with 8000 cfm of RA at 75 DB produces MA = 100*(2000/10000) + 75*(8000/10000) = 80 DB. OA: DB = 100 oF, WB = 85oF. RH = 55%, H = 49.4 btu/lb, DP = 80.8oF, W = 0.0229 lbs/lb. RA: DB = 75oF, RH = 40%. WB = 60oF, H = 26.4 btu/lb, DP = 49.5oF, W = 0.0075 lbs/lb. 7. In Q6, the mixed air is cooled to 50 DP. How much (1) sensible heat (2) latent heat (3) total heat, and (4) moisture was removed? The dew point (DP) of the mixed air is 56.2oF. So the mixed air reaches 100% RH (saturated) when it is cooled to 56.2oF DB. Additional cooling occurs along the saturated line (100% RH line). At DP = 50oF, DB = 50oF, WB = 50oF, RH = 100%, H = 20.3 btu/lb, W = 0.0076 lbs/lb. MA mass = 10000 ft3 * 0.075 lbs/ft3 = 750 lbs. Specific heat of air = 0.241 btu/lb.oF. 8. In Q7 the cooed air at 50 DP is reheated to 55 DB. How much (1) sensible heat (2) latent heat (3) total heat, and (4) moisture was added? 9. 2000 cfm of outside air at 10 DB is mixed with 8000 cfm of return air at 75 DB and 40% RH. The mixed air is heated to 110 DB and then humidified to 45% RH. How much (1) heat, and (2) moisture was added? What is the final WB, DP, W, H? OA: DB = 10 oF, WB = 10oF. RH = 100%, H = 3.8 btu/lb, DP = 10oF, W = 0.0001 lbs/lb. RA: DB = 75oF, RH = 40%. WB = 60oF, H = 26.4 btu/lb, DP = 49oF, W = 0.0074 lbs/lb. Mixed air DB = 62oF and W = 0.006 lbs/lb. Air at 110 DB, 10% RH & 0.006 W is humidified to 45% RH. W increased to 0.0256. Moisture (latent heat) added = 10,000 ft3 * 0.075 lbs/ft3 * (0.0256 – 0.006) * 1030 = 1,514 btu/lb. At 110 DB and 45% RH (from chart): DP = 84oF. WB and H are off the chart. 10. In Q9, the heated and humidified mixed air is supplied into a room of volume 100' x 100' x 10' and at 75 DB and 40% RH. Wall-U = 0.2, Roof-U = 0.15, Glass-U = 1.0. 50% of the gross wall area is glass window. Outside Air (OA) at 10oF DB and 10oF WB infiltration into the room is 0.6 Air Changes per Hour (ACH). Specific heat of air and water vapor are 0.241 and 0.45. Latent heat of condensation / evaporation at 110oF DB is 1030 btu/lb. What is the new room DB, WB, DP, RH, W, H at the end of one hour? H at 110 DB and 45% RH is not on the psychrometric chart so calculate it. Total amount of Supply Air (SA) = 10,000 ft3/min * 0.075 lbs/ft3 = 75 lbs/min = 4500 lbs/hr. DB = 75oF, RH = 40%, WB = 60oF, DP = 50oF, H = 26.5 btu/lb, W = 0.0076 lbs/lb. Outside Air (OA) = 2000 ft3/min (9,500 /lbs/hr) at DB = 10oF, H = 3.8 btu/lb, W = 0.0001 lbs/lb. Infiltration Air (IA) = 0.6 ACH = 0.6* 100,000 ft3 / 60 = 1,000 ft3/min = 4500 lbs/hr. Increasing the Supply Air quantity (based on cooling load) will increase System and Duct Sizes and also Fan Energy consumption. Increasing the Supply Air Temperature above 110oF will be uncomfortable when it reaches the occupants. Climates with winter design temperatures below 30oF require a separate heating system. The heating source can be hot water, steam, electric resistance or gas. It could even be coal or wood fireplaces. The envelope of the building analyzed above had Wall-U = 0.2, Roof-U = 0.15 and Glass-U = 1.0 (1/8" single glass). ASHRAE Standard 90.1 for Chicago is Wall-U = 0.084, Roof-U = 0.065 and Glass-U = 0.46 for 40% to 50% glass. The typical U-value for coated 1/4 inch double glass is about 0.32. Using these envelope U-values, the building may not require a supplemental heating system. The U-values of the envelope must be such that the inside surface temps are reasonably high. It is possible to have the space air temp maintained at 75oF but the inside surface temp of the 1/8 inch single glass come close to the outside air temp. There is now radiant heat transfer from the occupants to the cold envelope inside surfaces. This is not comfort. So even with an efficient envelope, there has to be warm air supply (usually linear strip diffusers in the ceiling along the perimeter) to maintain the envelope surfaces, particularly the glass, at acceptable temps. To do this. baseboard radiation or radiant ceiling panels along the perimeter are used. 11. A classroom space is 100' x 100' x 10'. Room Air (RA) must be maintained at 75oF DB and 50% RH. Outdoor Air (OA) condition is 95oF DB and 60% RH. Sensible Heat Gain (SHG) through the walls, windows and roof is 89,500 btu/hr. Summer infiltration through the envelope is 0.1 air changes per hour (ACH). ASHRAE-Standard 62-2001 occupancy ventilation air is 15 cfm (ft3/min) per person. Sensibe Heat Gain (SHG) by each person is 250 btu/hr. Latent Heat Gain (LHG) by each person is 200 btu/hr. The air must be supplied at 55oF so that air reaching occupants is close to 75oF. (1) Room Sensible Heat Gain (SHG) and Latent Heat Gain (LHG). (2) Supply Air (SA) quantity CFM (Cubic Feet per Minute or ft3/min) at 55oF to offset the Room Sensible Heat Gain (SHG). (3) Supply Air (SA) moisture content to offset the Room Latent Heat Gain (LHG). (4) Total cooling (including ventilation) load across cooling coil in tons refrigeration. The heat and moisture content in the Supply Air must be less than the required Room Air heat and moisture content by the amount of the SHG and LHG in the room. Air density is 0.075 lbs/ft3, air specific heat is 0.241 btu/lb.oF and there are 60 minutes in an hour. To convert CFM * 4.5 = lbs/hr. (ft3/min * 0.075 lbs/ft3 * 60 min/hr = lbs/hr). 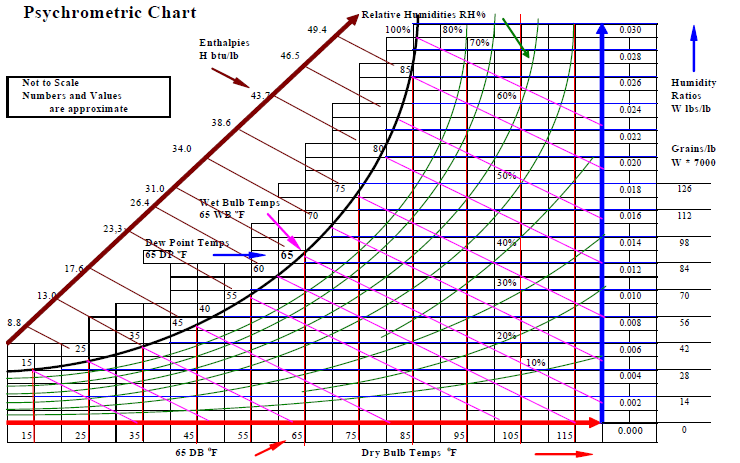 Heat gain or loss is Mass (lbs or lbs/hr) * spht * DT where DT is the change in temperature. The factor 1075 is latent heat of condensation for water vapor at 32oF. This is a safe high value. Room Area (A) = 100' * 100' = 10,000 ft2. Room Volume (V) = 10,000 ft2 * 10' = 100,000 ft3. SHG from People = 500 P * 250 btu/hr per person = 125,000 btu/hr. LHG from People = 500 P * 200 btu/hr per person = 100,000 btu/hr. SHG from Lights = 10,000 ft2 * 2.0 w/ft2 * 3.41 btu/watt = 68,200 btu/hr. SHG from Receptacles = 10,000 ft2 * 1.0 w/ft2 * 3.41 btu/watt = 34,100 btu/hr. SHG through envelope = 89,500 btu/hr. Infiltration = 0.1 ACH = 0.1 * Volume = 0.1 * 100,000 = 10,000 ft3/hour = 166 ft3/min (CFM). Infiltration mass = 10,000 ft3/hr * 0.075 lbs/ft3 = 1,000 lbs/hr. OA: DB = 95oF, RH = 60%, WB = 83oF, DP = 79oF, H = 47.1 btu/lb, W = 0.0218 lbs/lb. RA: DB = 75oF, RH = 50%, WB = 63oF, DP = 55oF, H = 28.3 btu/lb, W = 0.0093 lbs/lb. SHG (infltr) = (166 ft3/min * 4.5) lbs/hr * 0.241 (spht) * (95 - 75) = 7,223 btu/hr. LHG (infltr) = (166 ft3/min * 4.5) lbs/hr * 1040 * (0.0218 - 0.0093) = 97,400 btuhr. Total Room LHG = 100,000 + 97,400 = 197,400 btu/hr. Supply Air CFM * 0.075 * 60) lbs/hr * 0.241 * (T-room - T-supply) = Room Sensible Heat Gain. Supply Air CFM = SHG / (1.08 * (Tr - Ts) ) = 324,000 / (1.08 * (75 - 55) = 15,000 ft3/min. Space Area (A) = 100' * 100' = 10,000 ft2. Volume = 10,000 ft2 * 10 ft = 100,000 ft3. Occupancy is 20 ft2/Person. No. of People = 10,000 ft2 / 20 = 500 People. Outdoor Air CFM = 500 People * 15 cfm/Person = 7,500 ft3/min. Ratio = 7500/15000 = 0.5. Return Air CFM = SA - OA = 15,000 - 7,500 = 7,500. Ratio = 7500/15000 = 0.5. H = 0. 5 * 47.1 + 0.5 * 28.3 = 37.7 btu/lb. W = 0.5 * 0.0218 + 0.5 * 0.0093 = 0.015 lbs/lb. The Mixed Air (or Cooling Coil entering air) at 85oF DB and 68oF DP has to be cooled to 55oF DB (Cooling Coil leaving Air). Since 55oF DB leaving air is less than 68oF DP entering air, the leaving air is saturated. So leaving air is saturated (RH = 100%) and WB = DP = DB = 55oF. Cooling Coil leaving air H = 23.2 btu/lb and W = 0.0091 lbs/lb to offset Room Sensible Heat Gain (SHG). 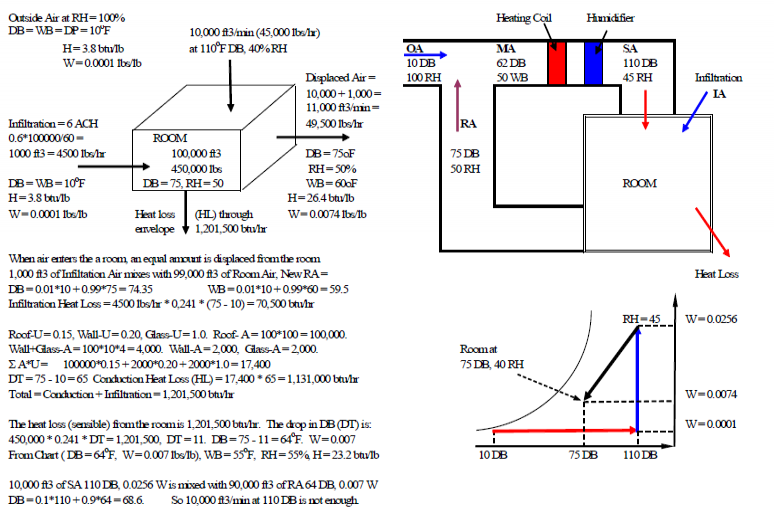 But the leaving air at DP = 55oF and W = 0.0091 lbs may not be enough to offset the Room Latent Heat Gain (LHG). So determine the required W and DB to offset LHG. (CFM * 4.5) * (W-room - W-supply) * 1060 = Room Latent Heat Gain. W-supply is unknown. CFM has been calculated as 15,000 ft3. The factor 4.5 converts cfm to lbs/hr. The factor 1060 is the latent heat of condensation for water vapor at about 55oF to 45oF. 3.37 – 362.5*Ws = 1. Ws = 2.37/362.5 = 0.0066 lbs/lb. At Ws = 0.0066 and RH = 100%, the DB = WB = DP = 47oF. So the mixed air has to be cooled to 47oF and then reheated to 55oF. 15,000 ft3/min * 4.5 * (H-entg - H-lvg) = 15000 * 4.5 * (37.7 - 18.7) = 1,282,500 btu/hr. 1 Ton cooling = 12,000 btu/hr. Cooling Load Tons = 1,282,500 / 12,000 = 107 tons. LH cooling = 15,000 * 4.5 * 1060 * (0.015 - 0.0066) = 601,020. The air leaving the cooling coil at 47oF must be reheated to 55oF. Re-Heat load = 15,000 ft3/min* 4.5 * spht * (55 - 47) = 67,500*0.241*8 = 130,140 btu/hr. Cooling Coil (CC) Apparatus Dew Point (ADP) and CC Bypass Factor (BF) were not considered in the previous case. BF is a ratio of the quantity of air that passes through the coil without coming into contact with the coil cooling or heating surface to the quantity of air that is cooled by the coil surface. BF = 0.2 means that 20% of the air passing through the coil was not heated or cooled. ADP is the coil (average contact surface) temperature. If the ADP is 55oF and BF = 0 (100% efficiency), the air can be cooled to 55oF. If the BF = 0.2, ADP = 55oF and the coil entering DB is 85oF, the average temperature of the air leaving the coil will not reach 55oF. It is going to be approximately 55 + BF * (85 - 55) = 61oF. So to get an coil leaving air temperature of 55oF with a coil BF of 0.2, the ADP has to be about 50oF. A coil is made up of tubes through which passes Hot Water (HW) for heating or Chilled Water (CHW) for cooling. There is heat transfer from the HW or CHW to the air passing over it. The tubes do not provide enough surface area to transfer heat from the HW or CHW to the air. To increase the surface area of the coil, fins (typically aluminum) are attached to the tubes (typically copper). The greater the number of rows of tubes (varies from 1 to 10) and fins per inch (varies from 6 to 14) the greater the amount of surface are between air and water. The greater the number of tubes the greater the water pressure drop (PD) and subsequently pump horsepower required. The greater the number of tubes and fins per inch the greater the air pressure drop (PD) and subsequently fan horsepower required. In the example the Cooling Coil (CC) Entering Air Temp (EAT) is 85oF and the required Leaving Air Temp (LAT) was 55oF but this had to be lowered to 47oF in order to remove enough moisture to offset the room LHG. So the coil ADP has to be less than 47oF. If the coil ADP = 44oF, then what is the coil BF? BF = ( LAT - ADP ) / ( EAT - ADP ) = (47-44)/(85-44) = 0.075. The coil is 92.5% efficient. This requires a high number of rows and fins per inch (FPI). For a pressurized office building with 1 person per 150 ft2 and no infiltration, the room LHG due to people is low and the percent outdoor air is usually between 10% and 20%. Unless there are internal processes (kitchenettes, etc) that add latent heat, a cooling supply air of 55oF is usually adequate to remove the room LHG and no reheat is required. The coil ADP in such a case is usually about 53oF. 12. An office space is 100' x 100' x 10'. ASHRAE-Standard 62-2001 occupancy ventilation air is 20 cfm (ft3/min) per person. SHG from People = 70 P * 250 btu/hr per person = 17,500 btu/hr. LHG from People = 70 P * 200 btu/hr per person = 14,000 btu/hr. Total Room LHG = 14,000 btu/hr. Supply Air CFM = SHG / (1.08 * (Tr – Ts) ) = 209,300 / (1.08 * (75 – 55) = 9,690 ft3/min. Outdoor Air CFM = 70 People * 20 cfm/Person = 1,400 ft3/min. Ratio = 1400/9690 = 0.14. Return Air CFM = SA - OA = 9,690 - 1,400 = 8,290. Ratio = 8290/9690 = 0.86. H = 0. 14 * 47.1 + 0.86 * 28.3 = 30.9 btu/lb. DP = 61oF (from psychrometric chart). W = 0.14 * 0.0218 + 0.86 * 0.0093 = 0.0112 lbs/lb. Leaving air is saturated (RH = 100%) and WB = DP = DB = 55oF. Cooling Coil leaving air H = 23.2 btu/lb and W = 0.0091 lbs/lb. Check if leaving air at DP = 55oF and W = 0.0091 lbs is not be enough to offset the Room Latent Heat Gain (LHG). So determine the required W and DB to offset LHG. (CFM * 4.5) * (W-room - W-supply) * 1075 = Room LHG. CFM * 4840 * (W-room - W-supply) = LHG. W-supply is unknown. CFM is 9,690 ft3. 31.15 - 3350*Ws = 1. Ws = 30.15/3350 = 0.0089 lbs/lb. At Ws = 0.0089 and RH = 100%, the DB = WB = DP = 55oF. So CC-LAT DB = 55oF ( = WB = DP) is just right for dehumidifying. 9690 ft3/min * 4.5 * (H-entg - H-lvg) = 9690 * 4.5 * (37.7 - 23.3) = 627,910 btu/hr. Cooling Load Tons = 627,910 / 12,000 = 52 tons. LH cooling = 9690 * 4840 * (0.015 - 0.0093) = 281,398. 55 - 17 = ADP -0.2*ADP.